I admit my life my be a little busy to take on a tapestry and bead diary in a single month. My weaving admittedly has taken a back seat to work, school and dodgeball this month, but I’ve still been working on my diaries, if not quite as much as I’d planned/hoped. The bead diary has been a lot of fun and the more I think about it, the more I think that every beginning bead weaver should start with a totally freestyle piece to get the hang of weaving beads and to take some time to play and experiment. Weaving beads without a plan is a completely different experience than weaving with a pattern (yours or someone else’s). It gives you the freedom to experiment and mix colors and create your own patterns. Maybe you’ll end up cutting your piece off the loom and reusing your beads (that’s probably what I’ll do with this one) but the process is a learning experience, and it’s really, really fun to just take some time to play. Presenting a new fringed Affinity Bracelet made by Claudia! It took her about an hour to make. What do you think? Do you like the fringe? What about the clasp? 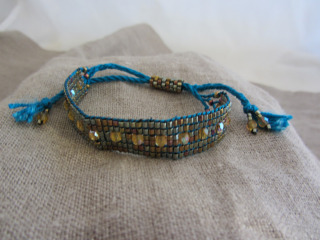 Tapestry/Bead Cuff Bracelets are an original bracelet design by Claudia Chase. 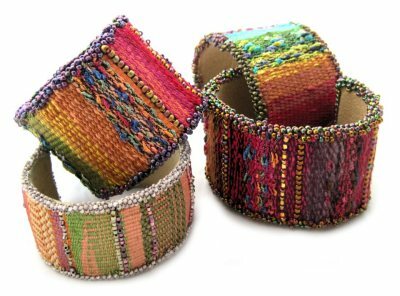 They combine tapestry techniques that can range from simple to advanced and bead weaving together to make unique, colorful cuff bracelets. These bracelets have been featured in Beadwork Magazine, Beads, Baubles & Jewels & on Craftsy. You’ll walk away from this section of the class with an understanding of setting up and a warping a Mirrix Loom, weaving fiber on a Mirrix Loom, weaving beads on a Mirrix Loom and even some more advanced tapestry techniques. It’s a great all-around project! Affinity Bracelets are a concept pioneered by the folks at Mirrix Looms. They use a beautiful fiber, like hand-dyed silk, as warp and different beads or fibers as weft. There are many different types of Affinity Bracelets, and the possibilities to be creative are endless. You’ll learn how to make two different types in day two! 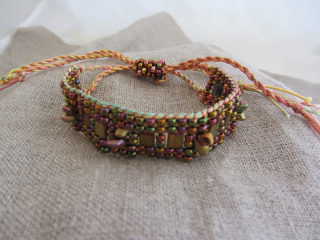 A third affinity bracelet can be woven if time permits using extra gold thread and beads from the kit. You will need a Mirrix Loom size 8″ or larger WITH a shedding device. The looms can be purchased on our website http://www.mirrixlooms.com/looms.html and should be purchased before the class. I decided my bead diary will be vertical. I also decided I won’t make every “day” exactly the same size, but this does mean I have to keep space in mind as I got towards the end of the month since I only have about 24 inches to work with. The green and red is January 1st (see the “1”?) and the pink and silver is the second. Simple, easy, fast! Like my bead diary, each “day” of my tapestry diary will not be the same size. You may want to make each of your days equal, though. I’m a more go-with-the-flow type of person. We’ll see where this goes! The first was done with half wool and half dyed Mulberry silk. The second is just wool. See the “2”? And that’s my start! Questions? Comments? So you like the idea of a tapestry diary? That poetic succinctness that I strive for (and don’t ever come close to meeting) is what attracted me initially to the concept of tapestry diaries. Weave every day. Practice techniques. But the real challenge: summing up the day in a tiny block of color. In the spirit of resolutions, I have started both a tapestry and bead diary for the month of January. I will catalogue my adventures here on the blog and in our Mirrix Looms Facebook group. I encourage you to grab a loom, join in and make your own! I’d love to see what everyone comes up with! What is a tapestry or a bead diary? A tapestry or bead diary is basically a piece you work on every day for a month. I’m not sure what the rules are, exactly, and you have complete creative freedom with this, but my plan is simply to weave a little section of the tapestry and of the bead weaving every day and each section of weaving will somehow represent that day. Maybe it will be in color (today is yellow, probably because there is sun here in Seattle for the first time ever. Or so it feels.) or an actual woven number or just a shape. Maybe each little piece of the weaving will be saturated with meaning. Maybe it won’t. We’ll see how it goes. Janette Meetze makes a stunning tapestry diary every month and posts pictures to her blog that can be accessed here. I recommend checking it out as a great example. Is this an online course? How do I do what you’re doing? Nope. This is just something I’m doing for fun and for me, but I’m happy to have company! You’re welcome to ask questions, of course, and I will tell you the specs of what I’m doing when I post, but don’t get too caught up in the details. Use what you have on hand. Make your piece as big or as small as you want. Use whatever size loom you have available. Don’t worry about mistakes. Play!